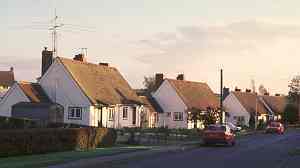 Wymeswold is typical of a working village, the development of which has evolved over many centuries. 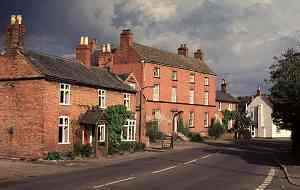 Far Street, despite the demolition of some houses in recent years, still retains one of the finest Georgian streetscapes in Leicestershire. 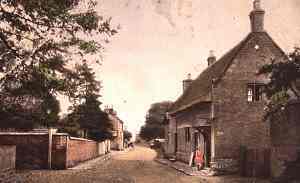 Dotted about the vilage are many pleasant corners with groupings of houses which illustrate pleasing vernacular architecture of the village. 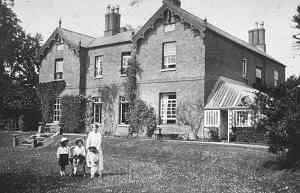 Alford House before 1915, while still in use as the vicarage. Update: The photo show Helen Edmunds, wife of Rev Claud Edmunds, with their three daughters, Dorothy, Cicely (middle) and Muriel, the youngest (born 22nd April 1917 in Wymeswold). I think this photo could be safely dated at 1919–20. 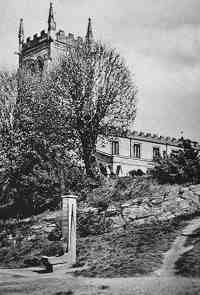 Claud was vicar at Wymeswold from 1914 until 1924 when he went to St Augustine's, Leicester. Information kindly supplied by Catherine and Mike Pritchard; Muriel is Mike's mother. On the edge of the village is a large Victorian house, the former vicarage and now named after the Rev Henry Alford who lived there. 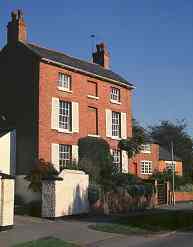 Along Far Street is Wymeswold House (previously known as The Hermitage), an impressive late 18th-century brick house on a rubble plinth with a large Swithland slate roof. One of the attractive features is the central door with a traceried fanlight under Tuscan-columned porch. 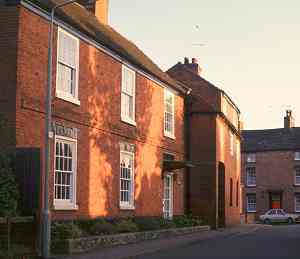 Far Street with the Manor House in 1993. The house on Far Street now known as the Manor House is still a large and imposing late 18th-century three-storey dwelling built of now-mellowed brick, on an ashlar plinth (said to be from the steeple of St Mary's church after it had been dismantled following lightning damage in 1783) with a stone still course to the first floor. 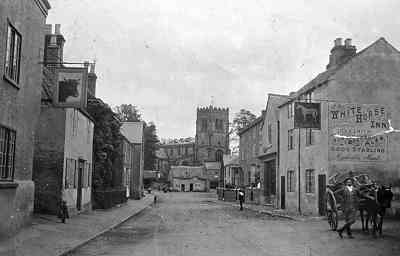 Far Street before 1908, showing now-demolished buildings on the right. Note the sign for the Bulls Head pub on the left (now Collington's butchers). Further long Far Street, on the south side, is the former White Horse inn. This is another Georgian building, three-storey with three bays and a symmetrical facade. Some very sympathetic restoration has been done over the years. The windows have been renewed in their original openings and have stuccoed heads with decorative keystones. Tudor Thatch from an old hand-tinted postcard. 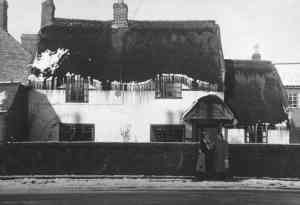 The oldest house in the village, Tudor Thatch, is on East Road. It is of cruck construction although now much altered. No. 3 Church Street in 1993. At the bottom of Church Street is one of many pleasant groupings. No. 3 Church Street is a large house presently painted white, originally built in 1734 but added to and altered later. Against it is three-storey and three-bayed with typical symmetrical facade and a six-pannelled door with a traceried fanlight. The house carries a Sun Insurance sign and the initials F W M over the door. To the left of the main house a two-bay two-storied range of later buildings was in use early in the 20th century as a cheese-making establishment. 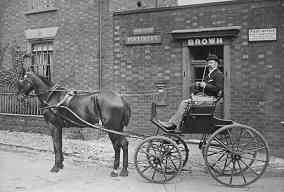 Philip Brown outside the Post Office in the early 20th century. The side of the old Post Office in 1987. On the 'wiggle' in Church Street stood the previous Post Office. This was demolished about 1990. Further up Church Street is a two-storey house with 16-light sash windows known as The Vines. This house has a pump in the garden dated 1768, which one would assume is the date of the house. Two views of The Stockwell, with the now-removed pump. Note the street light in the lower picture. In the centre of the village is The Stockwell. This short connecting road originally had, as its name suggests, a well situated near where the present bus stop stands. The lower part of The Stockwell is bisected by the triangular grassed area with four lime trees, known locally as Queen's Park. Its land originally had cottages on it. On the western side are newer buildings with the incorrectly-named Rectory Place (Wymeswold has never been a rectorial benefice). On the eastern side is St Mary's church, a footpath alongside the church and then a trio of interesting old properties. Brook Street showing 'usual' flooding before the River Mantle was confined and the willow trees planted. Brook Street runs parallel with Far Street and has the advantage of the River Mantle running through most of its length. There are many fascinating houses along this street. One group includes no. 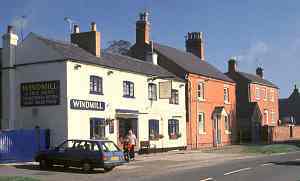 's 77, 79, 81 and the Windmill Inn. No. 77, known as The Dower House, is early 19th century. This large property, painted white in stuccoed brick with a Swithland slate roof, tall sash windows and decorated barge boards, has its main facade at right angles to the street. Alongside is Goscote House. 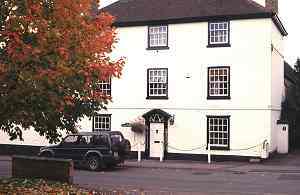 The owner here has a copy of all the relevant deeds and indentures relating to owners and occupiers since the mid-18th century. It is built of brick with a Swithland slate roof, three-storey with three bays and a symmetrical facade having traditional 16-light sashes but with the central windows blank. There is a large wing to the rear. Rose Cottage early in the 20th century. Further down Brook Street is one of the oldest houses in the village, known as Rose Cottage. Late 16th or early 17th century, it is cruck-framed with brick in-fill. Of the timber frame, the war plate, corner posts and arch braces are visible externally, also some ends of the cross-ceiling beams and gable trusses. It has a thatched roof which was redone in the early 1980s. Technically this house in 1 ½ storeys high. This means you have to lie down on the floor in one upstairs bedroom to be able to see out of the tiny window. There is also reputed to a ghost! 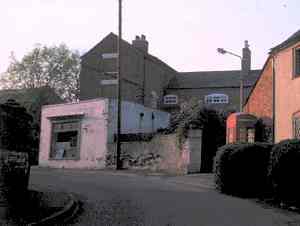 The 'Swedish houses' in London Lane in 1993. 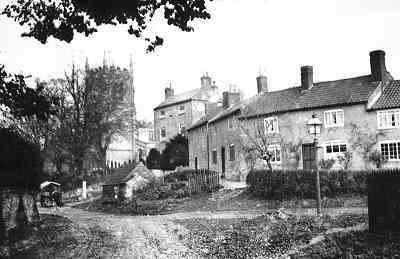 In the 1930s houses were built on London Lane in what was the first major extension of the village in recent time. The houses are built on previously undeveloped land and were followed in the late 1940s by the prefrabricated 'Swedish houses' on the southern part of London Lane and in the 1950s by the Council development on Hoton Road. The village-based building company, Wooton's, built a number of new houses in the 1960s and 1970s and Jelson's in the 1970s and 1980s. In the early 1990s Mendwest and Shire Properties built on 'in-fill' sites in the village. Many other notable buildings, some in the village and some outlying farms, also deserve mention; but a complete survey is outside the scope of this appraisal. Originally published in A Portrait of Wymeswold 1991; minor updates 2002; addiitonal information about the Alford House photograph 2014. Copyright Wolds Historical Organisation. Photographs copyright Joy Brown or Bob Trubshaw.